Runners push themselves to the limit as they run a 100 miles over the Rocky Mountain peaks in the San Juan Mountains north of Durango. Caroline Chaverot was lost in the dark, pacing up and down a steep mountainside, fearing she had lost the race in the process. Bloody and beaten, Chaverot found the trail after what she estimated was 90 minutes. She was certain she had lost the massive lead she had built during the first two-thirds of the Hardrock Hundred Endurance Run through the San Juan Mountains. When she reached her next aid station five miles later in Telluride, she found out she still had a big lead. That’s all the 40-year-old from France needed to hear, as she fought through a rib injury and multiple lacerations to become the first woman to finish this year’s race. She tackled the 100.5-mile course in 28 hours, 31 minutes, 50 seconds. She finished seventh overall. Fearing she was losing time to her closest rivals, Chaverot said she was running too fast trying to refind the trail, and that’s how she fell. Finally, she got back on course and made her way to Telluride, where she stayed for only a brief period while expressing her inner frustration. “I scrambled down and fell quite a lot,” she said. “I think I have a rib injury, and back. ... It’s funny because (the course) is pretty well-marked except at this one place. I had done it the other day, but in the night it is not the same. I didn’t recognize it at all. Chaverot wasn’t slow before she got lost. She was on pace to beat Diana Finkel’s women’s record of 27:18 set in the same counter-clockwise direction in 2009. At Mile 42, she was 30 minutes under the record pace. At Ouray at Mile 56, she was only 13 minutes off the overall lead of Kilian Jornet, Joe Grant and Mike Foote. Even after going off course for well over an hour, she was still only 30 minutes behind the record pace at Mile 82. But the extra energy she spent paired with the injuries suffered slowed her down the rest of the way. Three-time champion Darcy Piceu placed second. The 42-year-old from Boulder finished in 29:22:37. She ran a steady race for 10th overall and worked her way past Durango’s Hannah Green, third-place Nathalie Mauclair, 47, and two-time defending champion Anna Frost. Mauclair, of France, finished third in 30:34:25. The 35-year-old Frost from Durango by way of New Zealand, was the fourth woman to kiss the rock in 30:45:02. Mauclair said she struggled on the big climbs, but she was in great spirits at the finish line. Early rain and hail during the first third of the race Friday made life difficult for all of the runners. Piceu said it took its toll and held everyone down. Green was one of those held down, as she struggled through the night after running in second place much of the day Friday. She finished as the seventh-place woman in 36:20:14. At 26, she was the youngest runner, and finisher, in the field. But nothing could hold Chaverot down. She once again proved she is the best women’s ultrarunner in the world with her win at Hardrock on a course that features an average elevation of 11,000 feet, 13 mountain passes taller than 12,000 feet and includes the summit of 14,048-foot Handies Peak. The win adds to her IAU Trail World Championships win in 2016 as well as her win at the 2016 Ultra Trail du Mont Blanc and the 2016 Skyrunning World Championship. Chaverot called Hardrock great training for the UTMB in her native France. She also said she’d like to return next year and try running the course in the clockwise direction, hoping not to get lost next time. 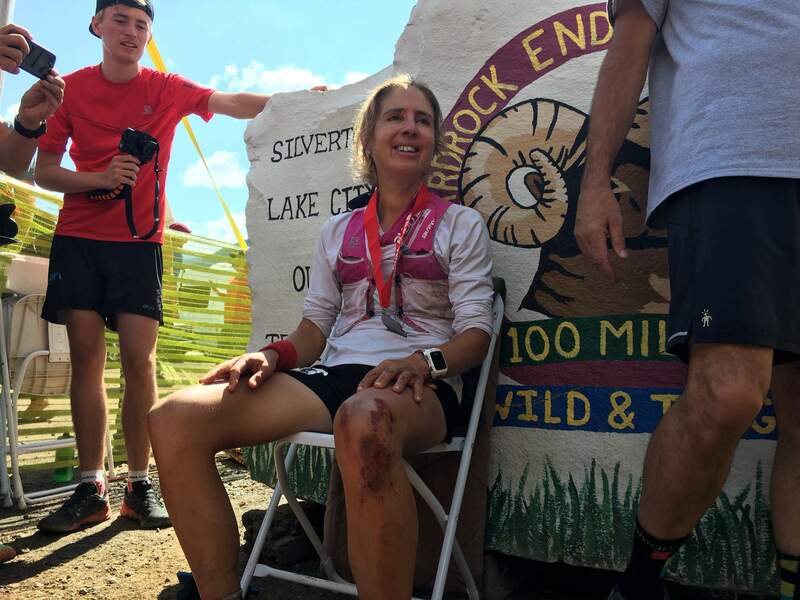 France’s Caroline Chaverot was bloodied at the finish line of the 2017 Hardrock 100, but she finished first place in the women’s field by a good margin, even after being lost for more than an hour. 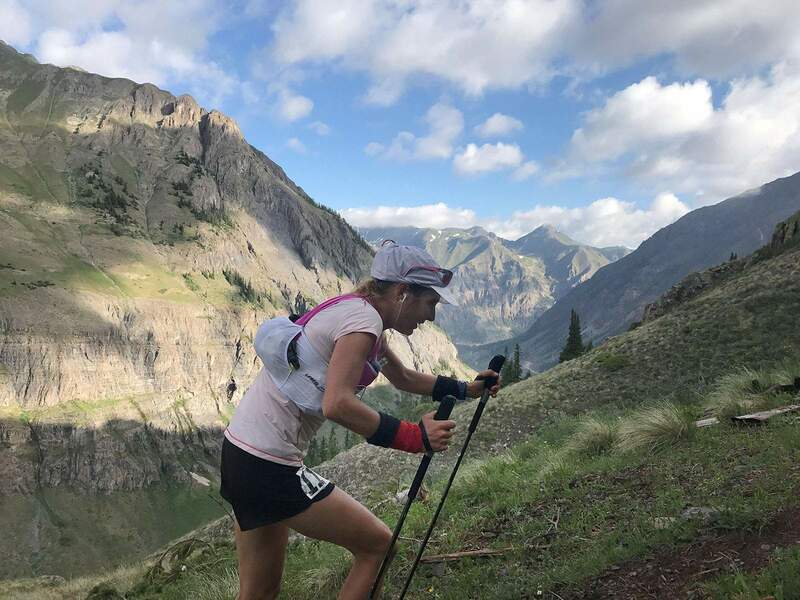 France’s Caroline Chaverot was setting a record pace before being lost between miles 67 and 72 on the Hardrock 100 course. Still, she found her way back to the trail after a few falls and cruised to first place in the women’s field.